WooCommerce and Magento are two of the most popular platforms for building an online store. Both a highly capable of creating any type of store you need. They’re filled with features to manage your inventory and sales, and both can be expanded to create something that’s completely unique. Choosing between the two isn’t always easy. 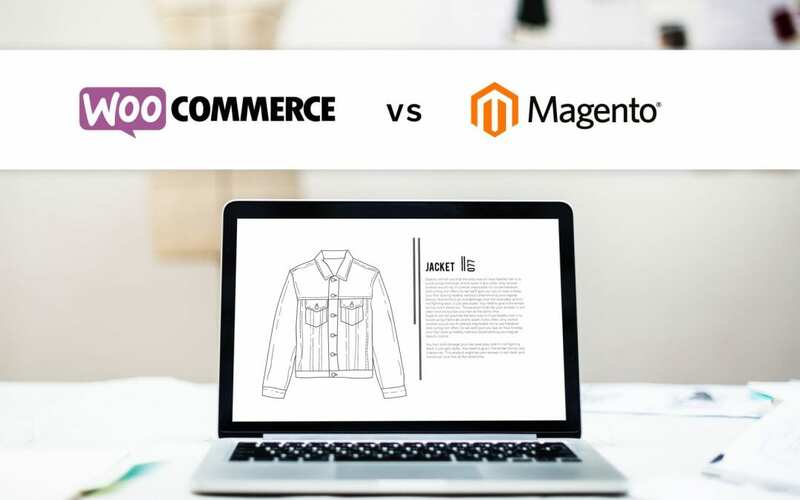 In this article, we’ll look at WooCommerce vs Magento to help you decide which platform you should choose to build your online store. 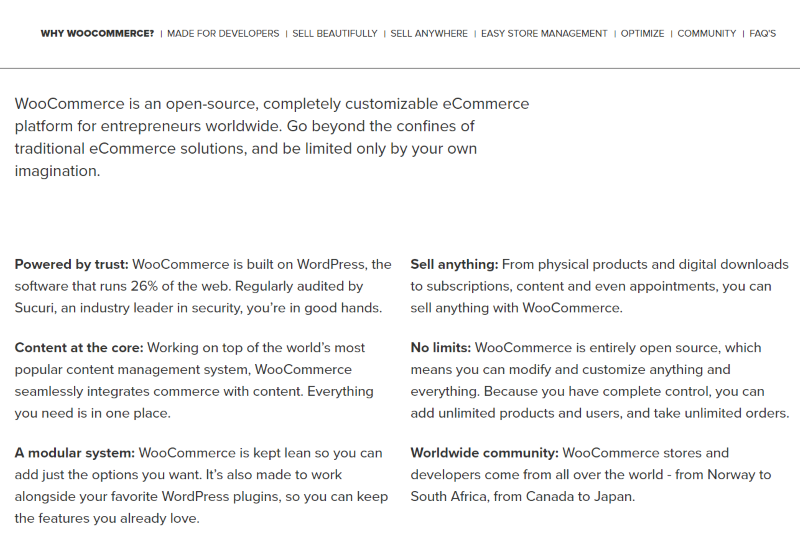 WooCommerce is owned by Automattic (makers of WordPress). Although there are a lot of great eCommerce options for WordPress, WooCommerce is the industry standard. It’s a free plugin that provides everything you need to manage your online store. There are lots of expansions available if you want to add specific features. WooCommerce is an all-in-one platform that integrates with WordPress to operate and manage an online store. 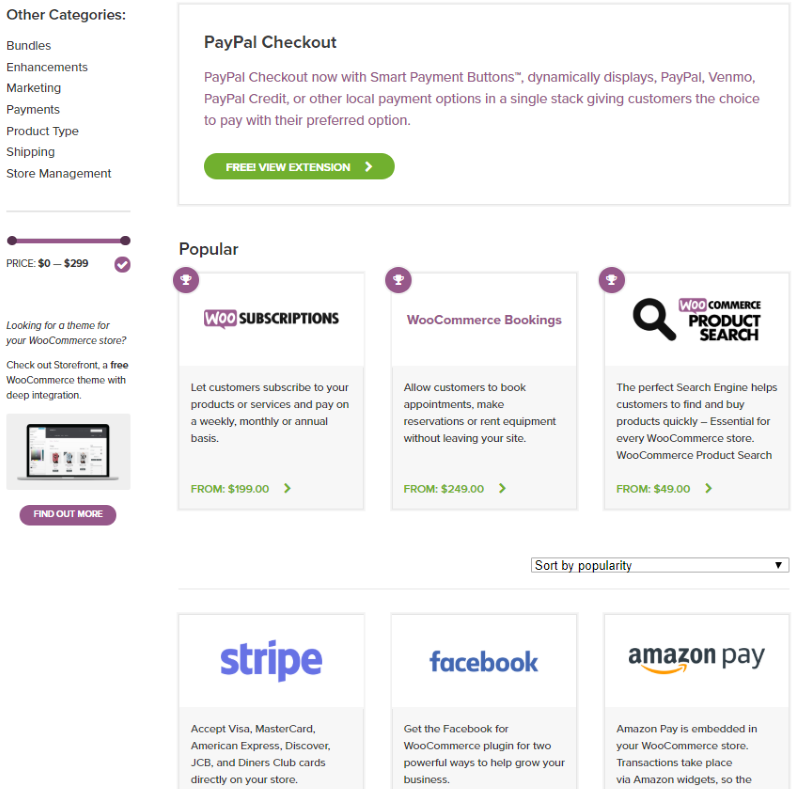 It includes payment gateways, order management, analytics (using expansions), shipping options, and lots more. Sell virtual or physical products, create membership sites, subscriptions, and more. It’s easy to integrate into your existing WordPress website or it can be a stand-alone website. It’s open source so you can create your own code. It’s great for beginners and advanced users. The plugin itself is free. You’ll need good hosting and any other costs associated with WordPress. 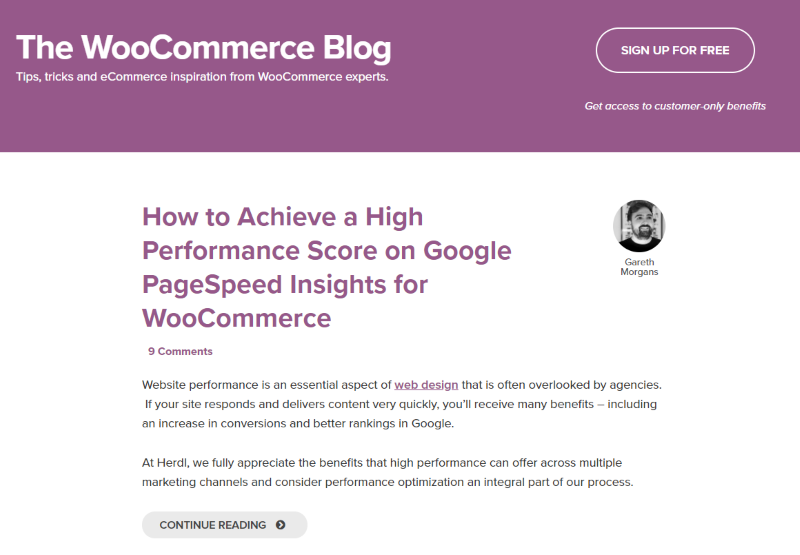 You can run WooCommerce on a cheap hosting plan, but it’s best to get something that was designed with WooCommerce in mind for improved performance. 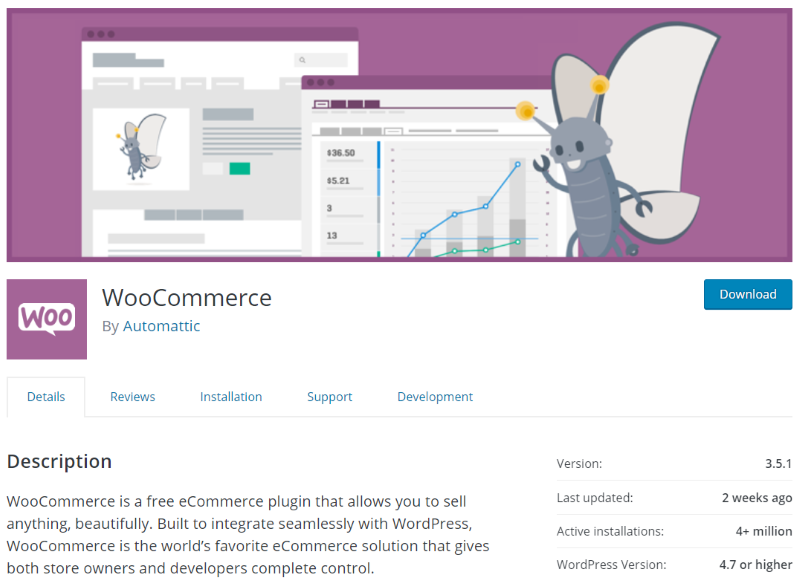 For more information about WooCommerce costs, see the article How Much Does It Cost To Set Up and Run a WooCommerce Store? Using WooCommerce is basically the same as using WordPress with a custom post type. Maintenance is the same as WordPress- just update the plugin and test, and make backups often. It’s intuitive and easy to set up. It’s ideal for beginners and for anyone that wants a platform that’s easy to maintain. There are currently over 400 free and premium extensions on the WooCommerce website. There are hundreds more across the web in the developer community. 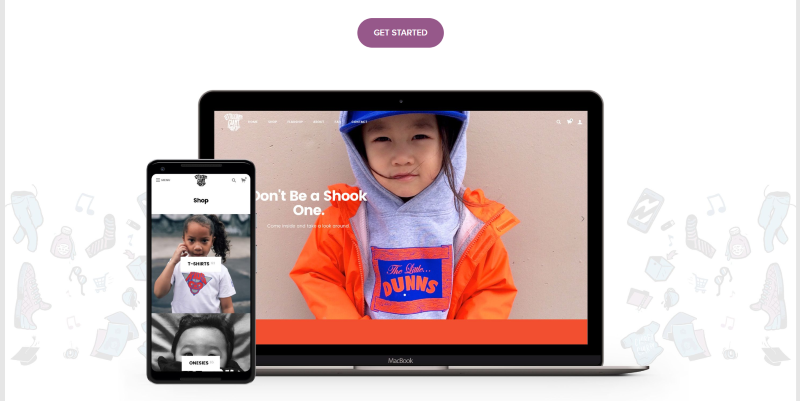 There’s also a free WooCommerce theme available with premium child themes, and WooCommerce is compatible with practically all of the thousands of themes available for WordPress. 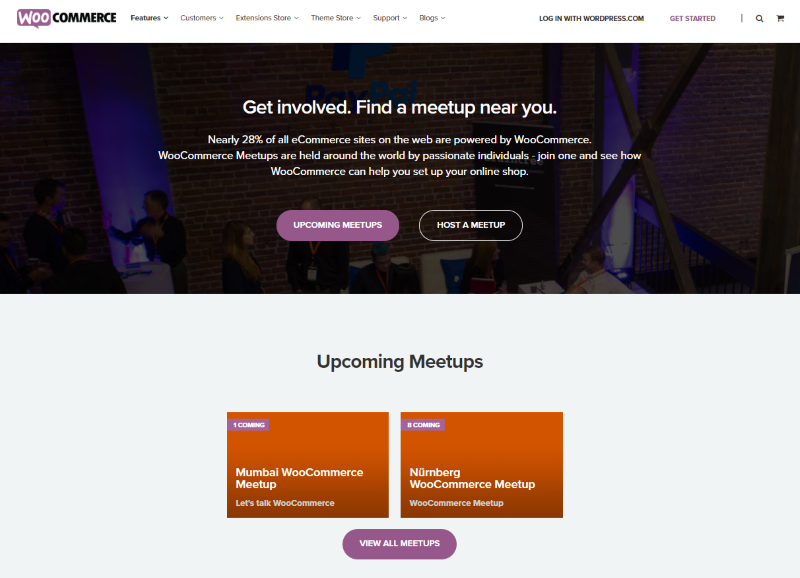 WooCommerce has a massive community with blogs, groups, meetups, YouTube channels, books, and more. It’s easy to find information or help if you need it. Support is provided through basic documentation, developer documentation, several blogs, a forum, a contact form on their website (for anything purchased through the site), and a list of customization partners. Training is provided through a training blog and user documentation. There are also lots of courses, videos, and tutorials in the community. Magento is from Adobe (makers of Photoshop and other popular creative apps). 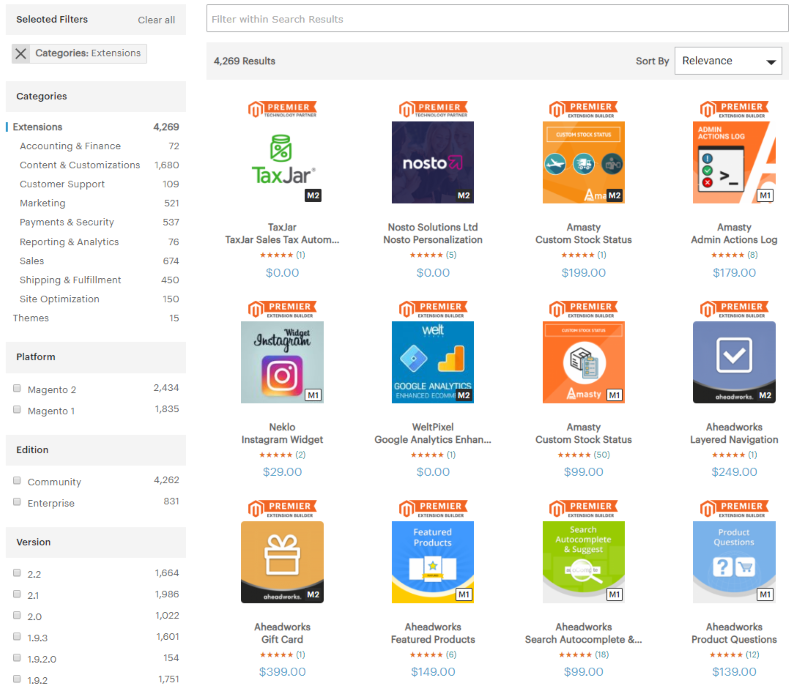 It has everything you need to create and manage an online store, and it has a ton of expansions. It has both a free self-hosted version and a premium cloud-hosted version available. 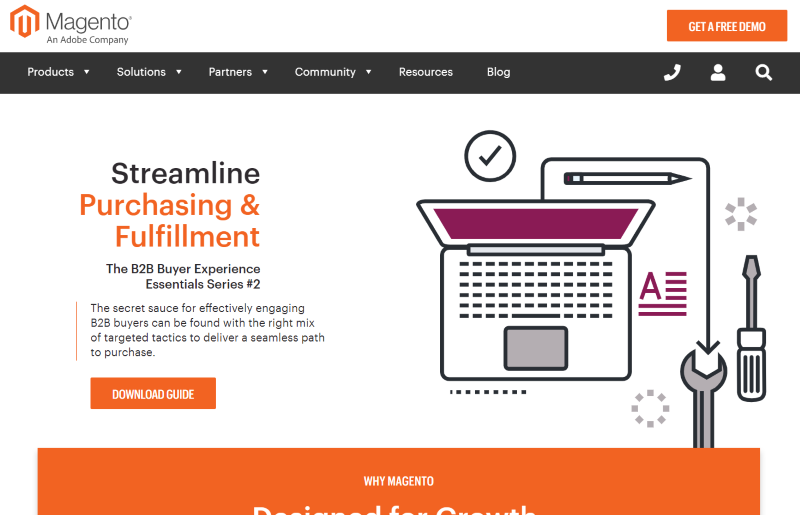 Magento is a high-quality platform that’s built for performance at any level. It has everything you need to create a store and manage it. It handles payments, provides shipping options, analytics, a couple of hosting options (you can use the Community version of it on different hosting platforms or you can use Magento’s hosting), business intelligence features, security, etc. 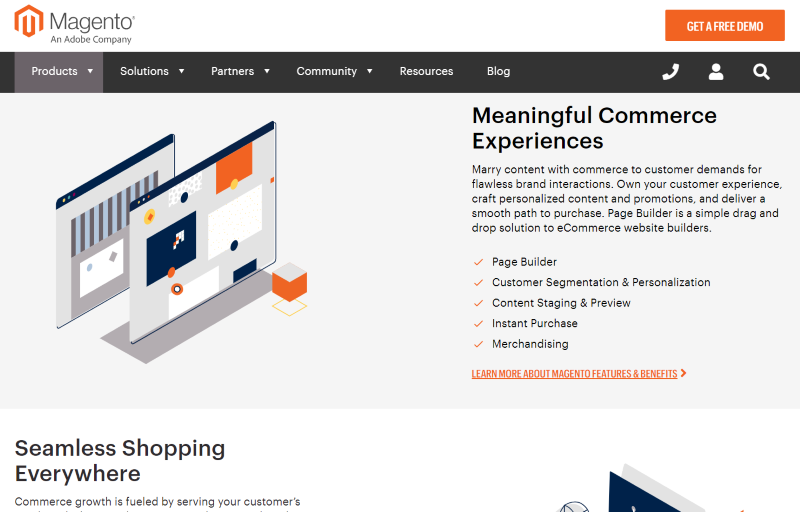 Design your store with templates or the page builder. It’s expandable through upgrades and extensions and it’s open source so you can add your own features in code. It’s built with larger companies in mind. There is a free option and a premium option. Prices are not given on their website, but others have reported the enterprise level to be above the $20,000 per year range. There are several solutions available so you can choose the features you need from small business to enterprise level. Although you can use your own host for the scaled-down Community version, using Magento’s paid hosting might be a better choice because of the difficulty of maintenance, and if you need to scale your store you might need to move to Magento’s hosting anyway. Magento is a complex platform. Uploading the Community edition to a host and maintaining it will require some developer skills. It has a higher learning curve and isn’t ideal for beginners. There are lots of free and premium extensions available. They’re developed for the specific Magento platforms and editions, such as Community or Enterprise. You can even create your own to sell in the marketplace. At the time of this writing, there are 4269 extensions and 15 themes available in the marketplace. Magento has a huge community within its online space. This includes the forums, contributors, and partners. There are also quite a few tutorials across the web and on YouTube and several groups on social networks. 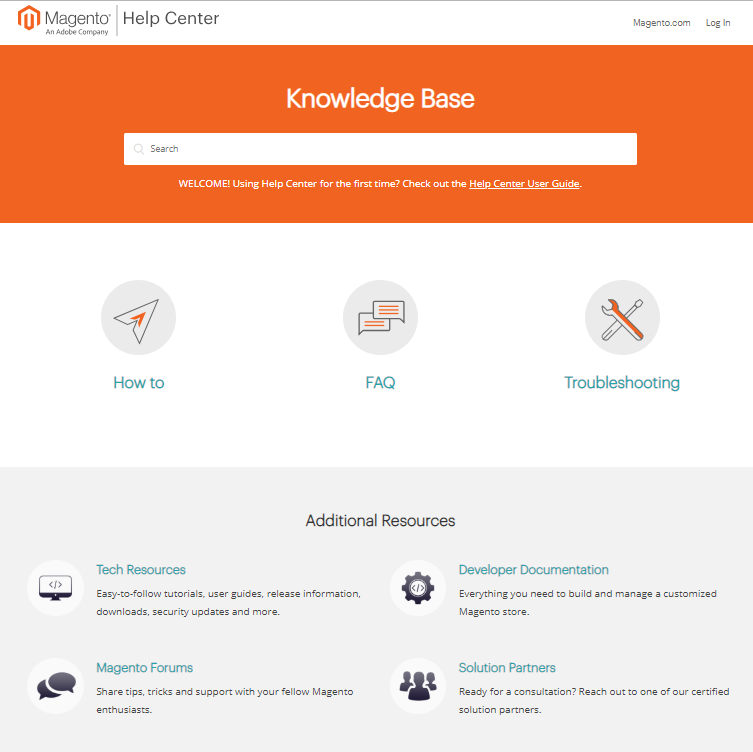 Support is provided by a help center with articles, FAQs, a forum, documentation, resources, and solution partners. Magento has a lot of training available. Training includes webinars, blog, tech resources, security center, Magento U, and developer documentation. There are also lots of tutorials available in the community. 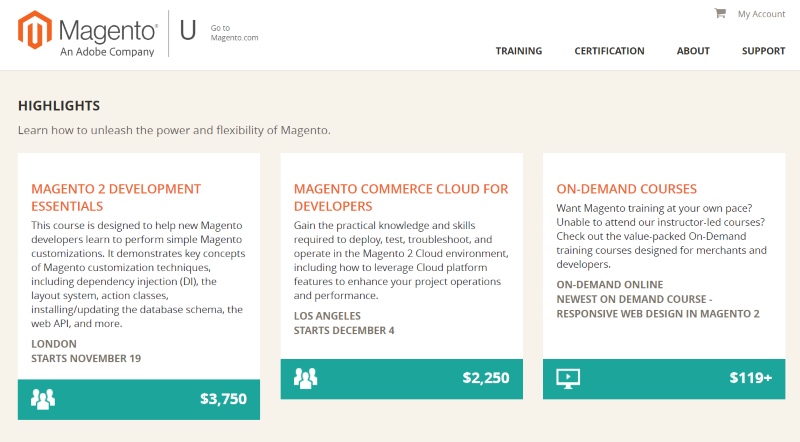 Magento U includes lots of courses with certification to become a specialist or a developer. That’s our quick look at WooCommerce vs Magento. Both are great platforms and have their advantages. Here are my ending thoughts on each. 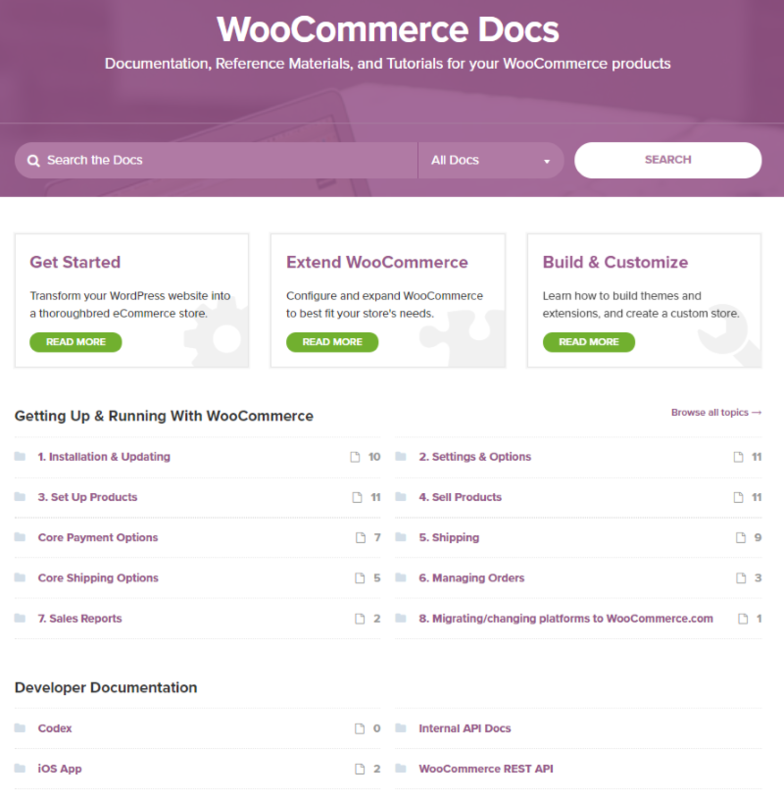 WooCommerce – this is a great platform for beginners or those staring with a lower budget. You can start small and work your way up- expanding and growing as you need to or your budget allows. The platform itself is free. It works with just about any theme and you can integrate it into your current website. You have your choice of hosts and you can move to a different host if you want. You can expand with free and premium add-ons. It provides everything you need to manage your store. It’s has a small learning curve and it’s easy to setup and use. It has a larger user-base so there’s more help available. It runs on WordPress, which is already the most popular CMS available. Magento – this is a great platform for those starting with funds they need to build a high-end platform from the start. You can still start as a small business and expand to a larger business later. Even though there is a free version that can be used with different hosts, the platform is best hosted from Magento’s hosting in order to get the best features. It is the more expensive of the two platforms, but it does include extra features and security, maintenance, etc. Magento is designed for serious business. It’s a powerful platform with tons of features. It’s difficult to use and set up on your own host requires developer knowledge. It’s a great choice for an enterprise-level business with a development team. Both platforms are solid choices for building online stores. It’s best to choose based on need and the level of skills your store will require. It’s better to spend extra time at the start to figure out which platform is best for your needs. It’s easier to learn that way and it can be difficult to move from one platform to another. Which platform do you prefer between WooCommerce and Magento? Let us know what you think about them in the comments. Randy A Brown is a professional writer specializing in WordPress, eCommerce, and business development. He loves helping the WordPress community by teaching readers how to improve their websites and businesses. His specialties include product reviews, plugin and theme roundups, in-depth tutorials, website design, industry news, and interviews. When he's not writing about WordPress he's probably reading, writing fiction, or playing guitar. Magento is a nightmare to deal with on custom changes, when dealing with Mage core. after reading the differences (loved the pros/cons summaries), magento should think about changing their company strategy. “For the full features you’ll need their hosting”, for example. most pro developers have their own dedicated server(s) and who wants limitations? After reading this article I am able to find out that which one is better for the online store. I think Magento is better then woocommerce in my opinion. Thank you for sharing this information and it is extremely helpful for my online store. Receive notifications about our new blog posts.